This bike tour starts in the most classic landscapes of Tuscany. We meet in Florence, load up the van, and head to Radda in Chianti (approx. 1-1/4 hour drive). After arriving at our countryside hotel and doing a bike fit, we’ll tackle a challenging warm-up ride. This takes us to a Chianti Classico landmark: Castello Volpaia, a medieval hamlet that tops a hill where fox (volpe) once roamed. (Being the highest village in this vicinity, we’re facing one of the tours’ longest climbs.) Today the entire village has been taken over and restored by the Castello Volpaia winery, which tucks its winemaking equipment discretely behind the ancient stone walls of this borgo. Those who wish can sample their first Chiantis and Super Tuscans at the winery’s drop-in tasting room. Then it’s a long descent all the way back to the hotel. Today we do a loop ride through classic Chianti territory, accompanied by stone walls hedged with lavender and rosemary, rustic sharecropper farmhouses, stately villas, ancient olive groves, and signs of the Black Rooster everywhere. Just as in medieval times, patches of cultivated land alternate with dense forests that seem ready to burst with Renaissance falconers on horseback. 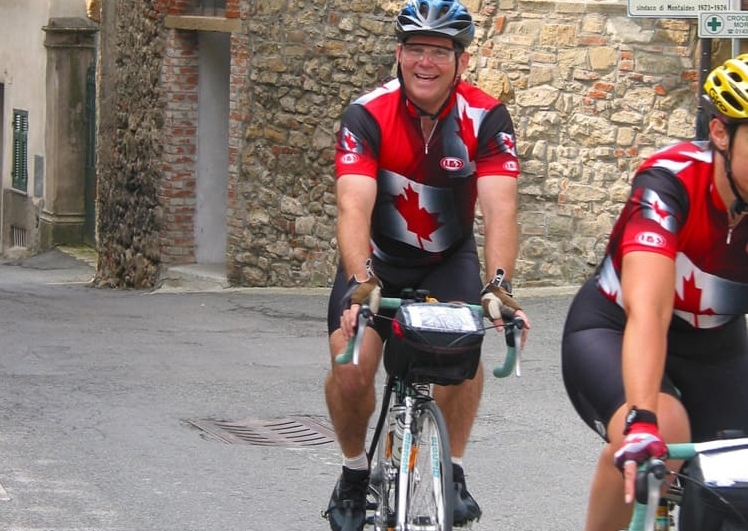 We’ll bike through some of the towns that were members of the Chianti League (a military coalition before it had anything to do with wine), including Gaiole in Chianti, where we’ll stop for lunch. For our post-ride winery visit, we can go to the family-run Vecchie Terre di Montefili, a gorgeous old property once farmed by local monks. Here we’ll delve deeper into the noble sangiovese grape and the concept of terroir. Today we take a break from biking and visit Siena. We'll start with a cappuccino at Nannini, Siena's most famous coffee bar, and sample their panforte, a dense cake laden with nuts, dried fruits, and spices (a medieval Power Bar, in effect). We’ll then tour the Palazzo Pubblico, one of the most spectacular city halls in existence. Among its highlights are three masterpieces of Italian Gothic art: Simone Martini’s Maestá and Siege of Montemassi, and Ambrogio Lorenzetti’s Allegory of Good and Bad Government, the largest landscape since Roman times. 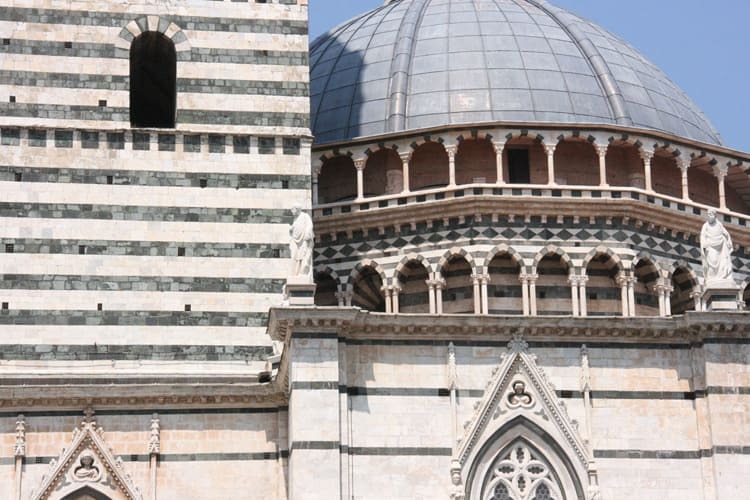 We'll end up at Siena's striped cathedral, where you’ll have to option to visit artworks by Michelangelo, Pinturicchio, and Donatello. Then you’re free for lunch, with time to shop or visit the Enoteca Nazionale, Italy's national wine museum/wine bar, located in a Medici fortress. On our return to Radda in Chianti, we can stop for our afternoon tasting at Castello Brolio, the birthplace of Chianti. Owned by the Ricasoli family since 1141, this crenellated castle has seen its share of wars. You can visit its magnificent gardens and walk along the ramparts, then hear about Chianti’s creation by the “Iron Baron” Bettino Ricasoli, and finally taste their highly regarded Chianti Classicos and Super Tuscan, called Casalferro. Dinner offers scrumptious updates of Tuscany’s woodland cuisine, based on wild boar (cinghiale), guinea fowl, and other game. Today we do a point-to-point ride from Chianti Classico to our hotel in San Gimignano. After biking along a scenic mountain ridge, we’ll encounter Castellina in Chianti. Once a fortified town, it’s now a charming wine village with a well-preserved historical center. We then cross into the San Gimignano zone and eventually climb to our hotel, a restored farmstead three miles outside of town. Today’s loop ride takes us on ancient roads that once hosted pilgrims on their journey to Rome. Nowadays you’re likely to see more pheasants than pilgrims. 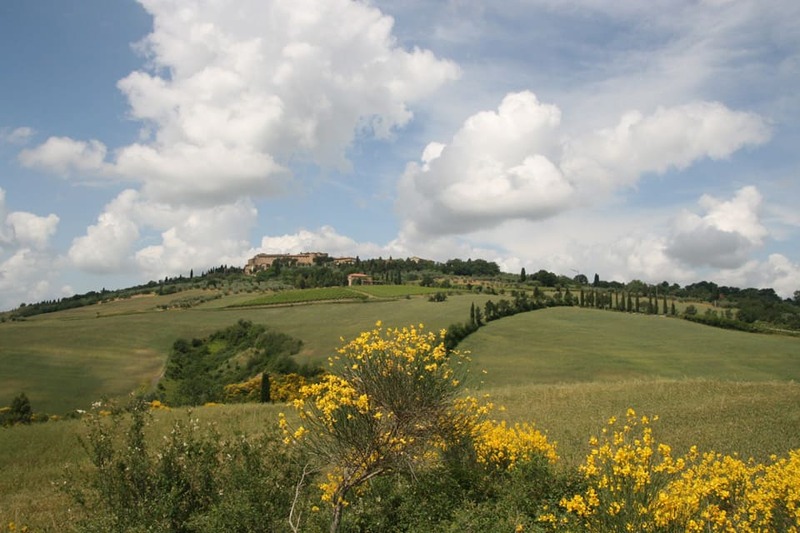 Our bike route traverses the countryside surrounding San Gimignano. We’ll pass by San Donato (last night’s dinner spot), then Castel San Gimginano as we move west, crossing the border into the province of Pisa. Again, pristine Vernaccia vineyards alternate with fields of wild flowers and woods thick with chestnut trees, porcini, and black truffles. The terrain is rolling and scenic. In the late afternoon, we’ll head to Panizzi, a pioneering winery that produces six different kinds of Vernaccia. Here we’ll also get acquainted with this region’s Chianti, known as Chianti Colli Senesi. This morning’s ride is a loop ride to Certaldo, the birthplace of Decameron author Boccaccio. We’ll again be treated to quiet roads surrounded by classic Tuscan landscapes, with cypress trees, vineyards, and olive groves lining the way. As Virgil said, “Bacchus love hills.” So it’s no surprise that Chianti and San Gimignano are full of hills. Rolling and gentle, short and abrupt, you’ll find all kinds. In general, they’re shorter, but steeper, than in Piedmont. But these are not mountains, so any seasoned biker should be able to tackle them with resolve, patience, and a good granny gear. As in Piedmont, the country roads are nicely paved and without much traffic, and drivers are respectful of bikers (having all biked themselves; it’s Italy’s main sport after soccer). The bike routes are around 50 km/35 miles per day, but since this is a customizable itinerary, we can add or subtract miles. Keep in mind that these are hilly miles, so 35 miles might seem longer in the saddle than on the page—or on your club rides, if you live on the flatlands. As in Piedmont, this is not the place to begin a biking hobby. 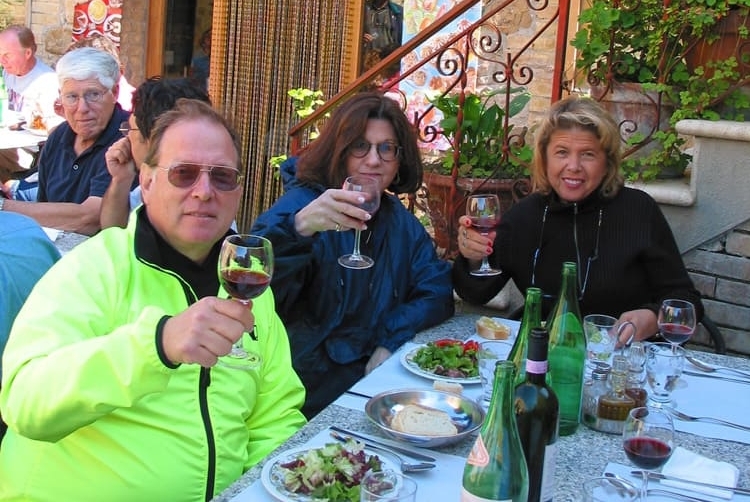 If you’re not already a biker, we suggest our walking tours as a better alternative for an active vacation. Florence or Pisa (continental), or Rome (intercontinental nonstop). To land in Florence or Pisa, you’ll need to connect somewhere in Europe. From the Florence airport to the city center, it’s a 20-minute taxi ride. If arriving in Pisa, the airport has its own train stop and is only an hour from Florence. Rome is the closest intercontinental airport, with direct flights to the US. If arriving in Rome, you’ll need to take a train from the airport to town (30 min.). Then from Rome’s main train station, it’s only 95 minutes to Florence on the fast train (EuroStar); the latter requires reservations. Plan to land in Italy at least a day before the tour begins; that’s necessary to be at our starting point on time. Most people spend the preceding night in Florence. For hotel suggestions, email us or consult a good hotel search engine, such as TripAdvisor or Venere. If you’re spending just one night, we recommend staying near the main train station, Stazione Santa Maria Novella, since that is our meeting point. Otherwise, take your pick of neighborhoods. Florence is not a huge city, and it’s very walkable. In fact, we encourage you to get out and walk around; the streets are a living museum! On our final day, we’ll have you back at the Florence train station by noon. Because this tour does not include any time in Florence, we recommend spending a few days in this fabulous art city, either before or after our tour. Florence is easy to navigate on your own. But there are also excellent thematic walking tours offered by our friends at ContextTravel. If you’d like to explore other small-sized cities in Tuscany, Florence is well connected with Lucca (1 hr, 20 min) and Arezzo (1 hr) by train. And it’s just a hop and a skip to Rome on the EuroStar express train (1 hr 35 min). When packing, check www.weather.com. Go to “Radda in Chianti, Italy” and “San Gimignano, Italy” to get a general idea of temperatures and forecast.